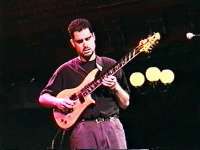 Ralph Novak's "fanned-fret" concept evolved from a desire to produce an instrument with balanced tone and string tension. "As a guitar player and professional repair technician with extensive experience, I had grown dissatisfied with the performance of instruments as they existed. Lack of definition in the lower frequencies, harsh, percussive trebles, and general "muddiness" of tone seemed pervasive, even when the performance of these instruments was optimized. Experimenting with composite materials and state-of -the-art electronics only made matters worse by highlighting these problems. My repair experience led me to examine scale length as a possible solution." The vibrating length of the string (the "scale length") is determined by the "nut" and the bridge "saddle." Fret placement is a ratio based on scale length so longer scales have more distance between frets. WHY IS SCALE LENGTH IMPORTANT? Scale Length influences both the tonal quality of the notes produced and the tension of the string at a particular pitch. The tonal effects of scale length are crucial to the final tone of the instrument. Woods, hardware, and electronics act as "filters" to string tone. They do not produce tone of their own and only modify input from the vibrating string. If particular harmonics are very strong, or altogether absent, those characteristics will be present in the final tone of the instrument. The "fanning" of the frets results from manipulating the scale length of the bass side of the neck relative to the treble side: the fret spacing is wider for the long scale and closer for the short scale. Looking inside a grand piano, or at a harp, we see that the string lengths vary with the pitches of the strings. But fretted instruments are traditionally constructed to a single scale length, negating the benefits of scale length relative to pitch. Since there are relatively few strings on most stringed instruments, compromises are made and string gauges are manipulated for workable results. Players accustomed to the compromises of single scale-length construction, are often pleasantly surprised by the richness and clarity of "fanned-fret" instruments. When the fanned-fret concept is applied to the six-string guitar, the resulting instrument has a "focused" sound -- clear, articulate and balanced. Some players say "more in tune" or "more accurate." One of the real advantages of the "fanned-fret" concept lies in its application to instruments like the seven-string guitar, eight-string guitar, five-string bass, six-string bass, baritone guitar, and mandolin. The range of tunings and number of strings force compromises that make these instruments poor performers or even impractical when constructed with the traditional single scale-length. The fanned-fret concept addresses those problems and makes these instruments playable and practical. Fanned Fret Guitar players include Charlie Hunter, Philip DeGruy, Joe Louis Walker, the California Guitar Trio, Robin Lewis, Mike Mushok, Dave Creamer, Allan Dodge, Leland Sklar, and Rick Derringer.